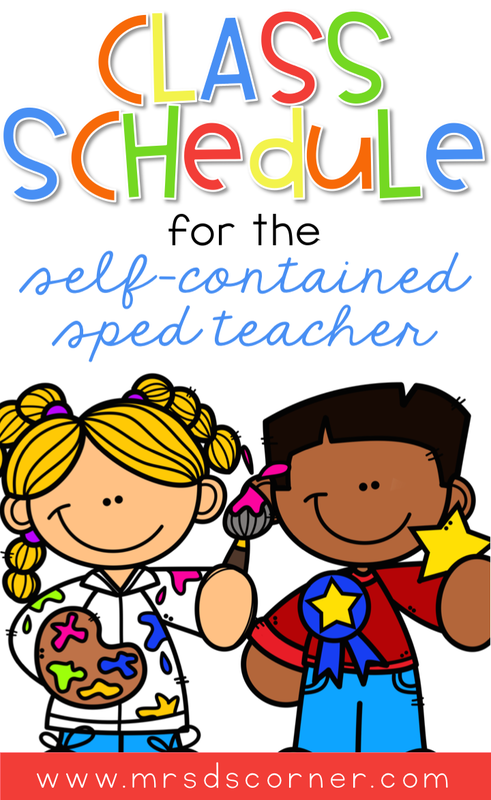 Being a self-contained classroom special education teacher, I often get asked about what my classroom schedule looks like, how I lesson plan for all the different ability levels, and just what one single day in my classroom looks like. I decided it may be time to share my classroom schedule, and give some pointers on how to make your classroom schedule work for you… no matter setting you work in. I do want to preface this entire post by saying that every single classroom is different. What works for me, may or may not work for you… and I promise you that my class schedule wasn’t a one time thing. It took me months to refine, and even some days it’s a work in progress. But hopefully with these tips and tricks, you’ll be able to build a classroom schedule that works for you and meets the needs of all of your students. Most of my students arrive on the school bus. Contract time for paras begins at 7:30 and teachers begin at 7:45, so my paras get all of the students off the bus and bring them to the classroom. Students put their belongings away… backpacks in their cubbies, coats off, lunches out (so we can determine who packed and who will be eating school lunch), and students get their Daily Communication Logs out and put them on the back table.. Students If they had a Reading Toolkit to return, they place it on the back table. Or maybe signed paperwork, order forms, fundraiser packets… you know, all that fun stuff. We ask each student if they need to use the restroom, as well as use this time to change any diapers or pull-ups. If a student eats school breakfast, one of us will take the child down to the cafeteria to get breakfast. They eat breakfast in the classroom at their desk. At 8AM, the school announcements begin. We stand for the Pledge of Allegiance (and the Star Spangled Banner on Friday’s) and listen to the daily announcements. After that, we begin our morning calendar routine. One special thing about the beginning 15 minutes of the day is I get a moment to say good morning to each child and ask about their night or weekend. It’s our 1:1 time to start out on a positive day. This hour is probably my favorite part of the entire school day. It’s a section of our schedule that I planned for one time. Yep, once. And it works every single day, it’s a routine the kids know, and it’s something my para could run if I were out for the day. To read a very in-depth blog post about the entire first hour of our school day, click here. It’s kind of crazy that our class is fortunate enough to all have specials around the same time. And if they don’t (I mean… there are 4 grade levels in our classroom!) they are either in inclusion or in resource. This is also the time when I take 45-minutes for teacher planning. IEP meetings are scheduled during this time as well, as well as other team meetings with admin, etc. ELA is such a short time, but we do SO. MUCH. STUFF. during this time. It’s really all meat and potatoes. Typically what is looks like is a whole group session at the back table. Whether that’s reading a story together and using a differentiated book companion, or a full on accommodated Guided Reading lesson, we’re all working. Monday and Tuesday, we start new stories. I use the leveled readers from Reading A-Z. They’re a life saver! To get student reading levels, at the beginning of the year, we conduct the Literacy Assessment to see what students know. Wednesday and Thursday are used for ELA centers and adapted work binders, quick checks on the stories we read, IEP goal data on specific students, and/or end of the story assessments. It really depends on the student. Through Monday-Thursday, students are also working on interactive sight word readers. Friday is for Fun Food Friday. Our students eat lunch at this time. They eat lunch in the cafeteria, and both myself and paras attend lunch with our students. We help them eat and monitor our student’s lunch period. In the past, a few of my higher level students would eat lunch with their inclusion classes. We take this time to wash our hands and get cleaned up from lunch. Some school years, our recess also overlaps this time and the beginning of computers in the classroom. But last year, students had recess with their inclusion classrooms, so we did not have a specific recess time. This time is so important for our class because at this time each day, our paras have Lunch Duty. So it typically looks like just me in the classroom with all of the students. Technology is a great way to occupy all students at once, and have them working on something academic. Especially if a student did not finish their morning work, I can successfully pull that student to finish their work while all other students are occupied. My second year in the self-contained setting, I won a grant to purchase 4 iPads for the classroom. We use them during this time. In our classroom, we have 5 iPads and 4 desktop computers for students to use. The most students (so far) that I’ve had is 7 at once. We rotate who uses the desktop computers and iPads. The first 30ish minutes are for academic purposes. Students need to work on something academic… whether that’s an app or Keyboarding Without Tears (which is phenomenal by the way!). The remaining 15ish minutes are for students to “play games” or watching Daniel Tiger. This remaining time is each child’s reward for completing their morning work and computer work. If a student doesn’t successfully complete all of their morning and computer work, they finish it up during this time. You can see a list of general apps here, and a list of math apps here. I think it is imperative that students have time in their day to be kids… and be kids outside of a 15 minute recess. 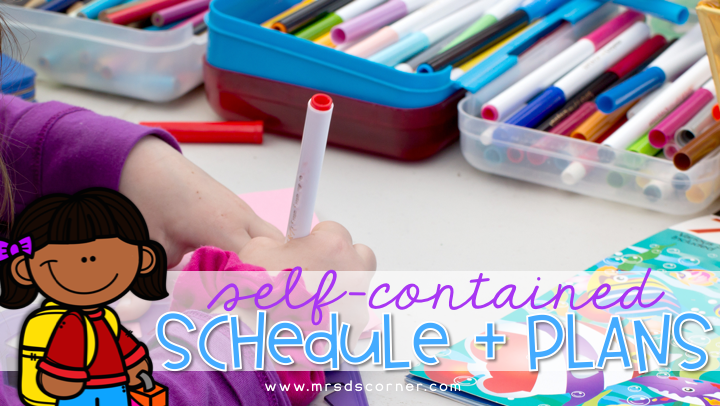 I know some teachers do smaller increments of time spread throughout the school day for sensory integration, so it’s something you make fit into your schedule. Along with computers, motor lab also serves as a time when I am alone with my students in the classroom while my paras eat lunch or finish up duties. A few examples of activities students can play with during this time: a sit and spinner, trampoline, dramatic play (dolls, kitchen, stuffed animals…), Legos and blocks, train set, sensory tubs (water beads, MadMattr or kinetic sand, PlayDoh, etc. ), indoor swing, sensory pods, body socks, sensory stepping stones… we have a very wide range of activities students can interact with. Snack and story time serve as teacher lunch time, so the paras are alone with students at this time. They use this time for students to eat snack, as well as use the restroom and change any diapers/pull-ups. Story time is pretty self explanatory. A para or a student will choose a book from the classroom library. I do have a tiered bookshelf for seasonal and monthly-related books that offer great recommendations for students to listen to. Our math block is one hour, give or take a few minutes to wrap up story time or head to inclusion around 2. In our classroom, it typically looks like all students at the back table working on individualized skills. A few days each week, we will do a whole group lesson on a targeted skill that a majority of my students are working on (like money, addition/subtraction, etc.). Other than that, it’s highly individualized based on grade level content that needs to be addressed and student IEP goals. Our Math Adapted Work Binder comes in huge handy here. Read more about differentiating Guided Math here. Many of my students attend inclusion for the social aspect of it and not necessarily for the academics, and myself or a para go to inclusion with our friends. My higher level students who can handle attending the regular ed setting on their own, go by themselves. Adults document inclusion time using this data sheet on a clipboard. All of my students have a clipboard for this purpose, and you guessed correctly if you guessed color coded clipboards. So far, it’s worked out well that all of my students attend inclusion for science and social studies at this time. To implement the grade level content on my students’ levels in our classroom, we utilize the Science and Social Studies Adapted Work Binders. Just like any other classroom, students have to clean up after themselves. They pack their own backpacks, listen for their name to be called to get their Daily Communication Logs, push their chairs in, use the restroom (if needed), and then wait patiently to be dismissed. We walk to dismissal together and at 3PM, students are dismissed (either to car rider or bus). WHERE DO YOU SHOWCASE YOUR SCHEDULE IN THE CLASSROOM? The classroom schedule is posted on the front board using a visual schedule. I print, laminate, and add magnets to the back so we can easily switch out parts of our day if needed. Individualized student visual schedules are posted on their desks (specials only) and on the cabinet doors. What questions do you still have about our schedule? Don you sell the schedule cards shown in this article. If so where can I find them? do you have a list of apps that you use during computer and Ipad time?